Random fact: I’m a direct descendant of John and Priscilla Alden, pilgrims on the Mayflower. John travels extensively to coffee-producing regions, farms, mills and processing plants to seek out and source the best coffees for InterAmerican, including single origin, regional specific, estate-grown, micro lots, auction lots and all types of premium-quality coffees. His efforts have taken him to, among other countries, Brazil, Colombia, Costa Rica, Ethiopia, Guatemala, Indonesia, Kenya, Mexico, Bolivia, Ecuador, El Salvador, Haiti, the Dominican Republic, Honduras, Jamaica, Nicaragua, Panama, Papua New Guinea, Peru, Puerto Rico, Tanzania and Venezuela. John works with InterAmerican’s Trading, Futures and Quality Control teams and directs the company's buying practices and stringent quality-control programs. He’s also been an active member of the Specialty Coffee Association of America and the Roasters Guild since its inception. Born in Brazil and raised in South America, he's fluent in Portuguese and Spanish. 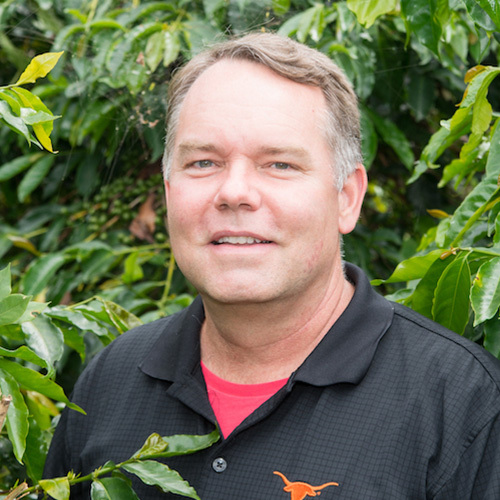 Prior to entering the coffee sector in 1994, John worked as a management consultant and regional analyst for the U.S. Southern Command in Panama with Booz, Allen & Hamilton. Before that, he was a paralegal for Paul, Weiss, Rifkind, Wharton & Garrison in NYC and an adjunct professor of Spanish at the University of North Carolina. He earned his BA from Oberlin College and did his graduate work at the University of North Carolina, Chapel Hill. He currently lives in the Houston area with his wife and two children. Best place you ever went on a business trip: The most interesting was Papua New Guinea, the Port Moresby, Western to Eastern Highlands, down to the port of Lae. Like no other! Profession you wanted to be when you were a kid: Oceanographer. I love the ocean! Favorite company outing or event: iFly indoor skydiving! Favorite adventure: Trekking to the top of Angel Falls, Venezuela. Best coffee memory: Watching Fred Houk (founder of Counter Culture Coffee), wandering off around coffee farms in Central America, making sure there were enough old-growth trees to support bird migration. I became friends with Fred in 1987, when I found him roasting coffee — Sulawesi Kalossi! — on a Probat sample roaster in a small coffee and wine shop outside Chapel Hill, NC. I had moved down from NYC to attend graduate school at UNC and was dying for a decent cup of coffee! This was long before “specialty” and small roasters were a thing. (Starbucks had a few shops and had not yet migrated East). After graduate school and other jobs, I sold my first bag of green coffee to Fred. Fred is gone now, but we, good coffee, the greater coffee community and his memory, continue on.